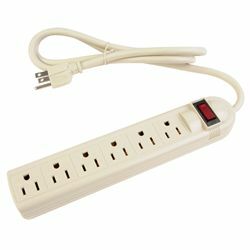 Get basic overload and surge protection (1MOV) with this value-priced UL-listed power strip. It has a heavy-duty 42-inch cord, 6 factory-tested grounded outlets and a built-in, resettable circuit breaker to prevent overloading. It's very compact and made of tough molded plastic with built-in screw head slots for under-cabinet or wall mounting.